Loud sounds and flashing lights are part of the fun of the July 4th celebration…but they are not fun for everyone! These sensory experiences can be overwhelming or frightening for children with ASD. 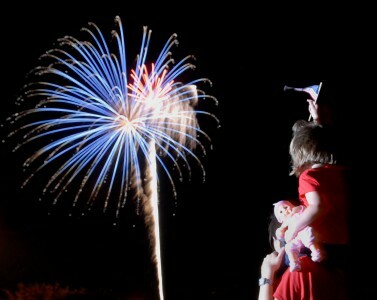 Here are some tips for families who are planning to attend a fireworks display this year. Prepare your child in advance. Help your child understand which activities will occur during the celebration you attend. You can read your child books about fireworks or show him photos or videos depicting fireworks (if showing videos, you can increase the sound gradually to get him ready). Make a picture book that illustrates the sequence of activities that will take place, including who else will be there, and where you will be sitting. Be sure to include some of your child’s preferred activities in the schedule, whether it be visiting a favorite ice cream shop or window shopping at a car dealership. Bring your camera to the fireworks this year, so you can document the events in preparation for next year! Bring along some of your child’s favorite items. Take your child’s favorite toys, snacks, and games to the fireworks. Bring comfort objects. Let your child help you decide what to bring. If he is uncomfortable in the situation, these activities may serve to distract or calm him. Help your child manage the sensory experience. If your child is sensitive to sounds, you may want to bring earplugs or noise-cancelling headphones to block out some of the noise. You can also teach your child how to predict when a loud sound will be coming, so he can prepare for it – for example, first comes the short burst, then the shooting streak, and then the popping sound and spiraling lights. (You can even make a game of trying to guess when the first “pop” will occur.) Bringing your child’s favorite music may help calm him down if needed. Consider choosing a viewing spot that’s at a distance from the fireworks, where the sound is less intense. Sunglasses may help your child manage the bright lights. If crowds are challenging for your child, try to create some extra space between your family and others, such as bringing a blanket that’s a little larger than you need, or even bringing a pop-up tent that he can retreat to. Give your child a way to convey the need for a break. Of course you will be watching your child for signs of discomfort so you can help him calm down before things escalate. If your child is verbal, you can check in with him every now and then. But it’s also important to give children without language a way to let you know that the stimulation is becoming too intense. One way to help your child communicate this experience is to teach him to hand you a picture or card to indicate that he needs a break. You can practice this before July 4th during other activities when you see your child becoming agitated. (When first teaching this new skill, you’ll want to give your child a break immediately when he requests one. However, once he gets the hang of it, he’ll need to learn that sometimes he must wait for a short bit before getting the break; you can teach this by showing him a special card that indicates that he’ll need to wait a bit.) But back to the fireworks…make sure that you have a plan for how he will get a break. For example, maybe you can go for a short walk, or if you parked nearby, he can sit in the car to calm down. Sometimes you may even have to leave early – but know that next year may be very different!